"Ravages of That Fell Destroyer, the Asiatic Cholera"
From A Mournful Elegy on the Unfortunate Victims, Who Fell Sacrifices to the Ravages of That Fell Destroyer, the Asiatic Cholera, at the Gravois Coal Diggings, Near St. Louis, Mo., June and July, 1849 by John Russel, teacher in the doomed district. Robert and Isabella Adam Grant and four of their children also died at Gravois Coal Diggings near St. Louis, Missouri, sometime in June,1849. They died on June 24, 1849, and were buried in the original "Old Picker's" cemetery - from Find A Grave for Isabella Adam Grant. "To the Gentlemen in Black Velvet"
From Jock Waugh's "little black book"
Agnes Ethel Hunter Russell. Mother's Day, 1964. Jack spent 2, possibly 3 years of WW1 in France. They lived at 144 Strathmartin Road, Dundee, and when Kitty was due to give birth to my father in August 1915, she went to stay with her parents, Catherine and Thomas Hellon Smith who lived in a house called Chipperkyle in Kelty, a small mining village in Fife. The message is written in pencil, rather smudged and faded, but I think it says - "How do you like our Divisional P.C.? Sorry at not writing last night but was over at a fire at one of our Ammunition Dumps. It was a great sight. Tonight I have been at our Cinema which starts tomorrow night. Moi is in charge of it and we are getting things in order and testing the engine & machine. We start with the "Somme" films. Will write sure tomorrow. J." Jock Waugh was awarded the Canadian Volunteer Service Medal and Clasp. The Canadian Volunteer Service Medal is granted to persons of any rank in the Naval, Military or Air Forces of Canada who voluntarily served on Active Service and had honourably completed eighteen months ( 540 days) total voluntary service between September 3, 1939 to March 1, 1947. Jock served from November 29, 1943 until he was honourably discharged on May 8, 1946. 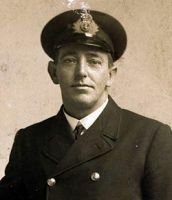 We are sorry to say, that Captain James Aimers, of the Diamond, had the misfortune to fall overboard last Sunday, at the entrance of the Cattegate; notwithstanding every effort made by the mate and ship's company to save him, he was drowned in their sight. - from Caledonian Mercury, Thursday 10 May 1792 The Kattegat is the area of sea to the east of the Danish peninsula. Captain John Russell, British Army (seated on right). Photo courtesy Lindsay Russell. Card of Thanks from Elizabeth Feld on the death of her husband. The Dalles daily chronicle. (The Dalles, Or.) 1890-1948, July 21, 1896, Image 3. Christina Brown (daughter of Jessie Clark and Henry Brown) married John Neil (Private, 28th Battalion, Australian Imperial Forces and son of Joseph Neil and Isabella Ternent) in Edinburgh on Oct 1, 1916. Agnes Orr McKee and David McKee and children Agnes and David (and probably Ann Jane) emigrated to the United States of America and arrived into New York City from Liverpool aboard the "City of Richmond" on April 14, 1883, and eventually settled in Montana. Daisy Waugh was a well known soccer player in Nanaimo, BC. He is buried at the Nanaimo Municipal Cemetery. He died at the age of 24 by electrocution in a mining accident. At the time of his death he was the highest pro soccer goal scorer in British Columbia. He was the youngest player to play in the provincial national championship. Residence at time of death: Milton Street, Nanaimo, BC. His death was reported both locally and nationally. David Orr. Photo courtesy of Goldie Rae. Final Rites Held for Mrs. Christine Orr. Courtesy of Goldie Rae. Death Claims Mrs. Sam Orr. Belt Valley Times, Dec 23, 1915.